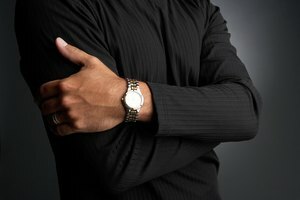 In many cases, the watch is the only part of your business wardrobe that you can customize, showing a bit of personal flair without ruining the professional look of your attire. You can change the band to a style that better suits you or adjust the links of the band so the watch fits differently. 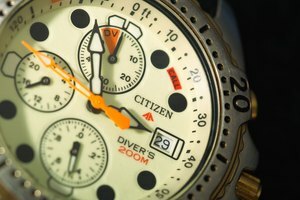 In order to do any of this, though, you will need to know how to remove watch pins. While there are special tools made specifically for that task, you can also do it with a few items you probably already have around the house. Locate the spring watch pins that attach the watchband to the watch face. Inside the end of the band is a pin that is expanded into the lugs to hold the band on. 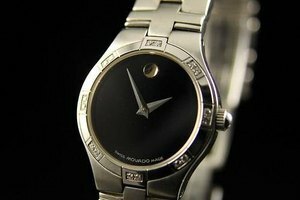 They are held in place by the watch lugs of the face. 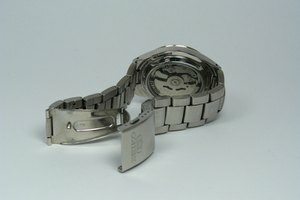 The watch lugs are the two "bump outs" on each side of the face that the watch band fits between. Insert the tip of the razor blade between the watch lug and the watch band so it catches the lip of the spring pin. Compress the pin back into the watch band and pull the band away from the lug. Repeat on the opposite side of the watch to remove the other half of the watch band. Turn the watch band over. Inspect the backside of the links. If there is no arrow cast onto any of the links, then your links are held together by threaded watch pins. Unscrew the threaded pin with a jeweler's screwdriver, turning it counterclockwise until it is far enough out of the link for you to remove by hand. Continue to repeat this action on each link you wish to remove. Inspect the backside of the links. If you see an arrow cast onto one side of a link, your links are connected with split watch pins. Hold a straight pin with the point centered on the watch pin head on the side opposite the arrow cast into the links. Push the straight pin against the watch pin with your thimble-covered finger until the split watch pin comes out the other side of the link. Remove links from the buckle or clasp first, rather then from the end of the watchband that was connected to the watch lugs. Remove one link from each side with each adjustment rather than all links from one side. This will help prevent the band from becoming lopsided in appearance.